Axel Ullrich was trained as a biochemist at the University of Tübingen (Germany) and earned a Ph.D. degree in Heidelberg (Germany) in Molecular Genetics (1975). After a postdoctoral tenure at the University of California in San Francisco he joined Genentech, Inc. in 1978 where his work led to the development of the first gene-based therapeutic “Humulin” (FDA approved 1984) and the first target-directed gene discovery-based cancer treatment “Herceptin” (FDA approved 1998) and the first “multi-targeted kinase inhibitor” SU11248/SUTENT for the treatment of GIST and Kidney Carcinoma (FDA approved 2006). Since 1988 he is Director of the Department of Molecular Biology at the Max Planck Institute for Biochemistry in Martinsried (Germany) where his research provided the basis for further cancer therapies. In addition, from 2004 to 2007 he was Research Director of the Singapore OncoGenome (SOG) project. 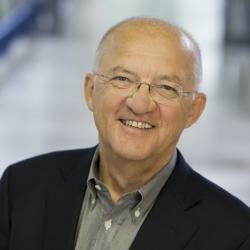 Axel Ullrich is the most successful translational researcher worldwide with one diabetes drug (Humulin, Lilly) and two cancer therapies (Herceptin, Roche; Sunitinib, Pfizer) in clinical application.